American public education is at a crossroads. For years now, public schools across the country have been struggling, desperately short on funds while facing extreme political pressure to improve student performance. For advocates of public education, these struggles have been a major cause for concern. But for advocates of privatization, they’ve been a highly profitable business opportunity. 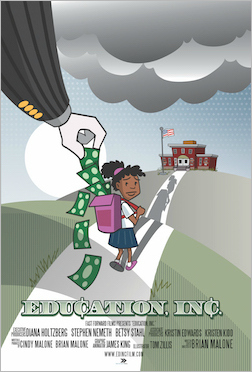 Education, Inc. is a film about the accelerating movement to privatize America’s public schools. Filmmaker and parent Brian Malone travels to public school districts across the country to see for himself what the privatization movement is all about, and to determine what it would mean for his own kids if we abandoned our public school system. Weaving striking footage from school protests and raucous school board meetings with commentary from some of the best-known educators in the country, Malone shows how private investors, large education corporations, and other for-profit interests have been quietly and systematically privatizing America's public education system under the banner of "school choice." Along the way, he clarifies the key issues at stake, and makes a powerful case for why public education matters. The result is a powerful and deeply personal look at a pivotal moment in the history of American education. "In the best tradition of investigative journalism, filmmakers Brian and Cindy Malone take on the issue of public school reform and funding. From the reasons behind a local contentious school board election to larger questions about charter schools, vouchers, and high stakes standardized testing, the film explores the national education privatization initiative that directs taxpayer dollars into the corporate education sector, with little or no opposition. Highly recommended."